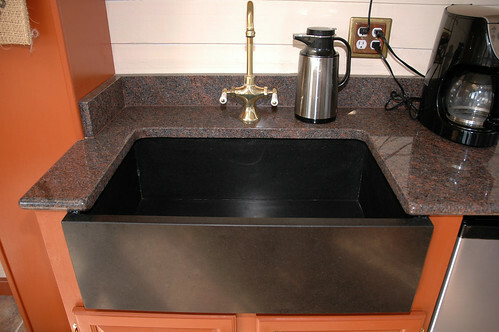 Dakota Mahogany is probably the most popular granite color that is quarried in the USA. It is quarried in South Dakota. Other names for Dakota Mahogany include: American Mahogany, Sunset, Whetstone, Brown Velvet and Carnelian. Dakota Mahogany has a black background with a reddish/ brown fleck in it. It's a really beautiful, warm granite. Dakota Mahogany is actually used a lot for monuments, signs, pavers and other outdoor applications because it is a really dense granite. It is able to withstand the effects of time and nature better than most colored granites. Also, because of the mineralization of Dakota Mahogany, it is nearly impervious to the dirt and debris (such as acid rain or industrial pollutants) that can stain and streak some monuments. So, chances are, you have seen Dakota Mahogany somewhere! Dakota Mahogany is available in 2 cm and 3 cm slabs. I don't like this color in the first picture of it close up, but when I see it in the kitchens it looks really pretty. I think it would look great with cherry cabinets, kind of pull out the red. Anyay, thanks for Slab Sunday. It's my favorite feature on your blog.